A considerable body of recent research suggests that inequality between ethnic groups has major socioeconomic implications. ‘Economists have long recognised that there is an association between inequality and development’, reported the Economist in 2015, drawing on a much-discussed article by Alberto Alesina, Stelios Michalopoulos, and Elias Papaioannou – but ‘what may matter most … is not inequality in itself, but economic differences between different ethnic groups’. Our September 2018 special section of Oxford Development Studies, ‘Horizontal Inequality: Persistence and Change’, offers a critique of, and complement to, this work. Although studies such as Alesina et al’s acknowledge that horizontal inequalities are not fixed endowments, they effectively treat them as such over considerable periods. In focusing on horizontal inequality’s impact, we argue, this literature has failed to wrestle adequately with horizontal inequality as a dependent variable, ie an outcome of various processes. The special section begins with our framing essay, which sets out conceptual, theoretical, and empirical reasons why more attention should be paid to horizontal inequality as an outcome. The rest of the collection offers a focused look into horizontal inequality at subnational levels in four countries: Nigeria, Brazil, India, and Guatemala. Anyone familiar with the work of Frances Stewart will see its imprint throughout this collection. In considering theories of change, for instance, our point of departure is Stewart and Arnim Langer’s discussion of the determinants of socioeconomic horizontal inequalities and factors contributing to their persistence. Building on this discussion, we spotlight six sets of factors that help to explain variation in horizontal inequalities across countries and over time. The first three deal with long-ago origins: the persistent influence of colonialism and conquest, historical institutions, and geographic endowments. The latter three speak to more recent influences and changes over time, due to processes of modernisation, migration and integration, and contemporary government policies. These six sets of factors figure both in the broader literature and in the articles in this collection. For instance, Belinda Archibong’s analysis of Nigeria points both to the role of colonialism and conquest, and to precolonial institutions. Likewise, Pedro Leivas and Anderson Santos’s study on Brazil locates the roots of horizontal inequality, alongside ethnic division, in both geographic (structural) factors and colonial histories. The last two articles in the collection –Nishant Chadha and Bharti Nandwani’s on India and ours on Guatemala – highlight the influence of government policies, including public service provision. Our framing essay also situates the country-focused studies within a broader global context, providing new analysis of cross-national patterns and trends in horizontal inequality. While a number of recent studies have relied on geospatial estimates or proxies in such analysis, we make a case for the continued importance of measures based on individual and household-level data compiled in censuses or surveys. We draw on two relatively new datasets (EIC and WIDE) that provide such information on horizontal inequality in terms of educational attainment (HI-E) for selected groups. Drawing predictions from theory, we consider how theory and data fit together. Consistent with our initial expectations, we find in particular a general trend towards a decline in HI-E over time between the 1960s and 2000s, along with considerable regional variation. We posit that these trends can be understood both in terms of contemporary shifts in government policies in support of greater social inclusion, and worldwide improvements in educational access, which in most regions have influenced not only equality between ethnic groups but also between other population subgroups (across sub-national regions, urban-rural divides, gender, and even wealth quintiles). 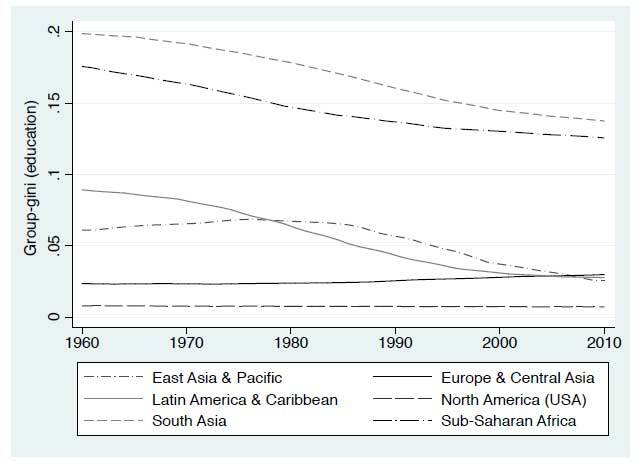 On the other hand, we also expected to find especially high levels of horizontal inequality in regions marked by settler colonialism, conquest, and slavery, such as Southern Africa and the Americas. This did not show up in our analysis. We suspect this lack of evidence is due in large part to the limitations of our data with respect to our questions (as they tell us nothing, for instance, about inequality in wealth and land holdings). Our work suggests a number of avenues for future research. One clearly is the need for further work on data that allow for – and empirically track – changes in horizontal inequality over time, both at national and sub-national levels. Despite big challenges and limits to data collection in this area, we think much more can be done in terms of reanalysis of existing surveys and censuses, new data collection, and innovative approaches to measurement. We also urge more attention to theory building and testing with respect to change in horizontal inequality, especially change over the short to medium term. For instance, in terms of government policy, there is substantial research into the impact of affirmative action policies on disadvantaged populations, but less work that explores more broadly the impact of untargeted programmes on horizontal inequality. Our article on Guatemala in this collection suggests that even untargeted educational reforms might have a positive impact on horizontal inequality, but targeted efforts might nevertheless be needed to address some persistent inequalities. There is also considerable space for studying the influence of other factors on horizontal inequality – beyond the six sets of factors highlighted above. In particular, recent global politics suggest the value of more focused consideration of the relationship between globalisation and horizontal inequality. Amy Chua, for one, predicted in her bestselling 2002 book that exporting free market democracy would lead to wealth increasingly being concentrated among ethnic minorities, producing ethnic conflict and a ‘world on fire’. Surely political scientists and economists should have more to say on the matter. This post also appeared on the blog of the Oxford Department of International Development, here.